What a way to end the season! The Bonaventure and Grand Cascapedia were red hot this week and we experience some of the best fishing of the season. It's said that pictures are worth a thousand words, well rather than hearing what i have to say, just check out our photo gallery for this past week. 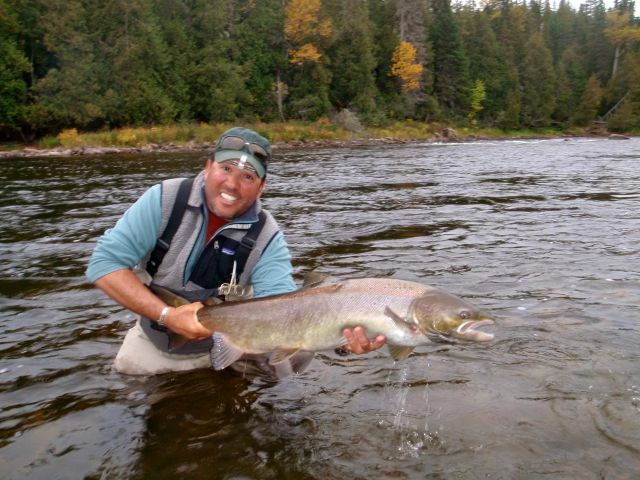 I have only one suggestion to all salmon anglers...... book a Late September trip for 2015, it's fantastic!!! 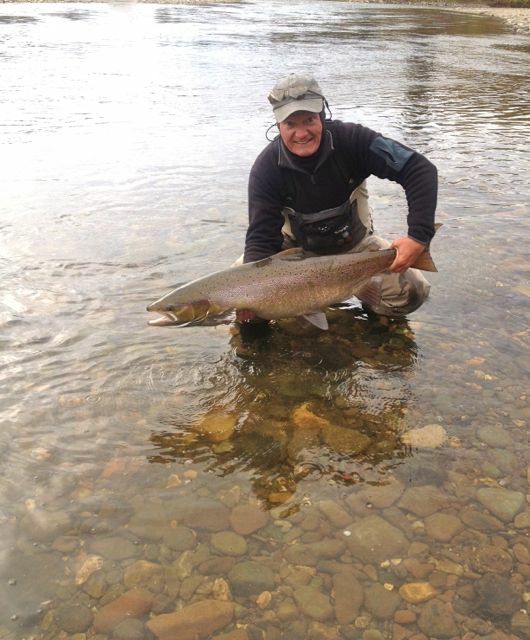 Salmon Lodge Regular Micheal Blades with a BIG Grand Cascapedia salmon, Congratulations Michael ! Peter Bennett releases a nice one back to the Grand, Way to go Peter! Joe Colletta sure knows how to get it done, nice fish Joe! Salmon Lodge regular John Robertson with his first of 2014, Nice salmon John! Our leaves have turned to bright autumn colors and frosty mornings are Parr for the course. It seems like just yesterday we were putting our canoes in the water for the start of a new season. Fall colors on the Grand Cascapedia. We are fortunate to have had another great season. While most salmon rivers around the world saw fewer fish than usual, we faired well in 2014, not the numbers of fish we usually see but not bad at all . The Bonaventure started later than normal but the returns were good overall. The Grand Cascapedia also did well, similar to the Bony our salmon arrived later than usual. The Petite Cascapedia fared well this season and returns were on time and in good numbers. 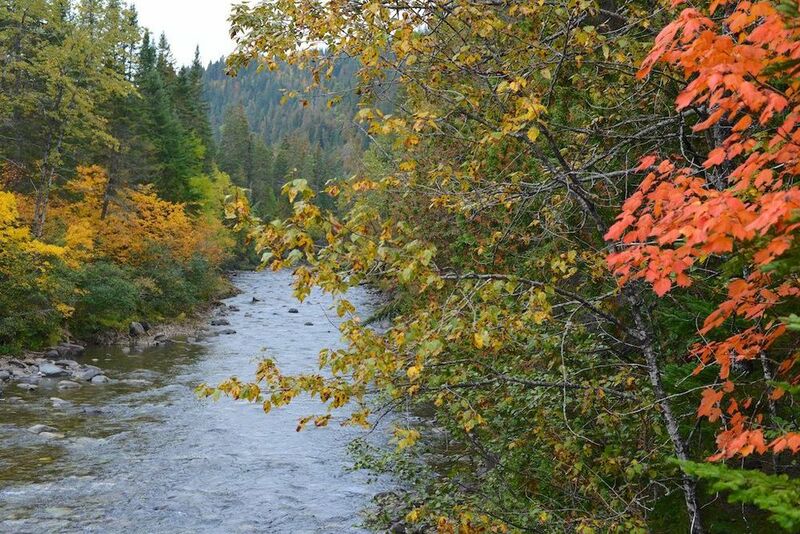 For the most part water conditions remained favorable throughout the season. A couple of weeks of low water in late July and August made fishing a bit more challenging, overall we received the rain we needed and fishing remained pretty consistent. 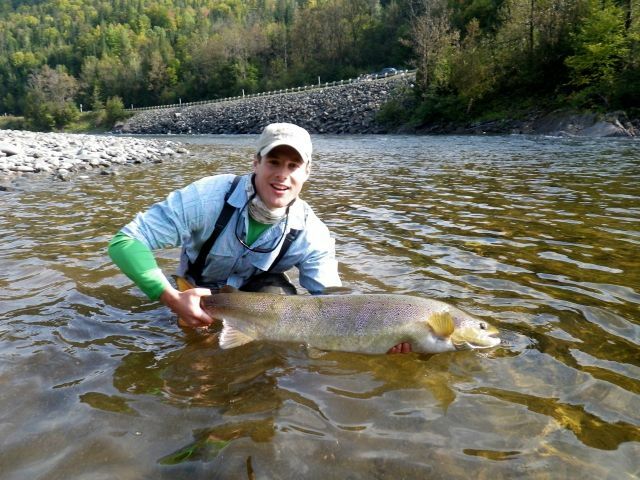 September was our best month by far with a good number of fresh salmon and good water conditions. 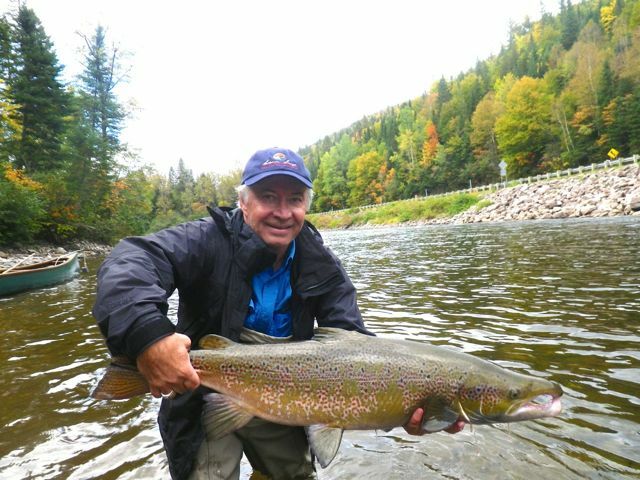 The fish counts on the Bonaventure in mid July and again in mid September showed good numbers of salmon in the river, fewer than a normal year but we did meet our spawning requirements. The same was true for the Grand Cascapedia where spawning numbers were also met. The Petite Cscapedia did well and surpassed the required numbers of salmon, good news. 2014 was defiantly a years for grilse, all three rivers had more grilse than normal, a good grilse year has always been followed by a good salmon year, 2015 should be great!